The Quebec Government is the biggest investor in this project. Private finance of only $25m has been provided by Coulombe, Chadha and Ulan Marketing Co. Ltd, an asbestos conglomerate from Thailand. The two Canadian businessmen are co-owners of Mineral Fibre Inc., the company which now owns the Jeffrey Mine. In light of the 2011 decision by the Thai Government to ban asbestos, the involvement of a Thai company in this scheme has raised several questions. 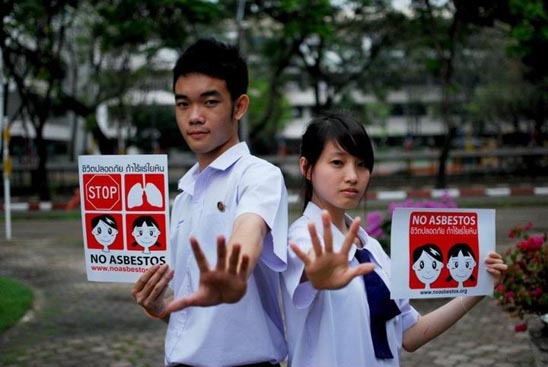 Even as civil society in Thailand continues to lobby Ministers to implement, as promised, legislation prohibiting the import, use and sale of asbestos and asbestos-containing products, commercial stakeholders are engaged in a fierce battle to reverse the ban policy. One PR campaign backfired quite spectacularly in April when officials from the World Health Organization held a press conference in Bangkok to reassert support for banning asbestos.3 The Thailand Ban Asbestos Network (T-BAN), the Alliance of Worker Councils, Teens for NoAsbestos and a range of civil society groups remain adamant that asbestos will be banned by the end of this year. The actions of the Quebec Government have been denounced in the British Parliament and in the Australian, Indian, British and Canadian media.4 On July 6, The Asian Journal, a publication from British Columbia, ran a front page attack on cowardly South Asian Conservative MPs too scared to speak out about Canada's hypocritical behaviour: while protecting its own citizens from the asbestos hazard, Canada is, The Asian Journal wrote, exporting Asbestos Terrorism and Mass Murder to Asia.5 Prime Minister David Cameron6 and Australian Senator Lisa Singh have added their voices to calls for a rethink of Quebec's asbestos policy. In Japan, Korea, Indonesia and India demonstrations have been held in front of Canadian embassies while groups in the Philippines, Korea and India have sent letters addressed to the Canadian authorities calling on Prime Minister Harper and Quebec Premier Charest to stop Canada's mining and export of asbestos (see letters: Philippines, Korea, India). Last week, epidemiologists joined the fray when the Joint Policy Committee of the Societies of Epidemiology issued a Statement on Asbestos that called for a global ban on the mining, use, and export of all forms of asbestos.9 This document has received widespread media attention and has been issued with a roll-out strategy to attract support from other epidemiological bodies and civil society groups especially those in asbestos-using and consuming countries. With the September election in Quebec looming and in view of the unpopularity of the Charest Government, is it nave to hope that the politicians might accede to the public outcry and pull the plug on this shameful scheme? In the days of the Olympic dream, one can hope. 1 Kazan-Allen L. New Asbestos Mine in Quebec. June 30, 2012. 2 Lalonde M. Analysis: Charest government may have miscalculated announcement to open Jeffrey Asbestos Mine with a $58-million loan. July 30, 2012. 3 Kazan-Allen L. Thailand's Asbestos Liars. May 1, 2012. 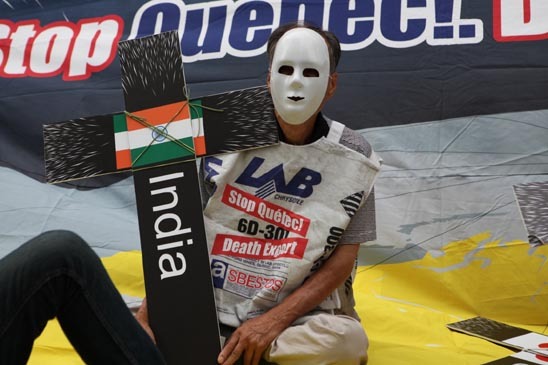 5 Desperate Quebec Premier Jean Charest is Going to Kill more Indians with Cancer-Causing Asbestos: What the Hell are Cowardly South Asian MP'S doing about it? July 6, 2012. 6 Hansards July 11, 2012. 9 Position Statement on Asbestos by the Joint Policy Committee of the Societies of Epidemiology.